You are viewing the documentation for the 2.1.0 release in the 2.1.x series of releases. The latest stable release series is 2.7.x. Now that we have built a first data model, it’s time to start to create the first page of the application. 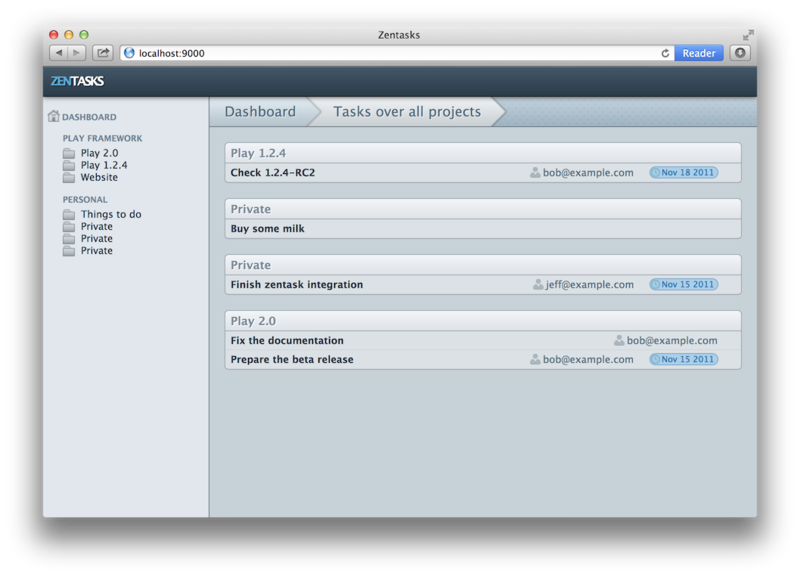 This page will be the dashboard, and it will show a summary of all projects and the todo tasks for those projects. In fact before coding the first screen we need one more thing. Working on a web application without test data is not fun. You can’t even test what you’re doing. 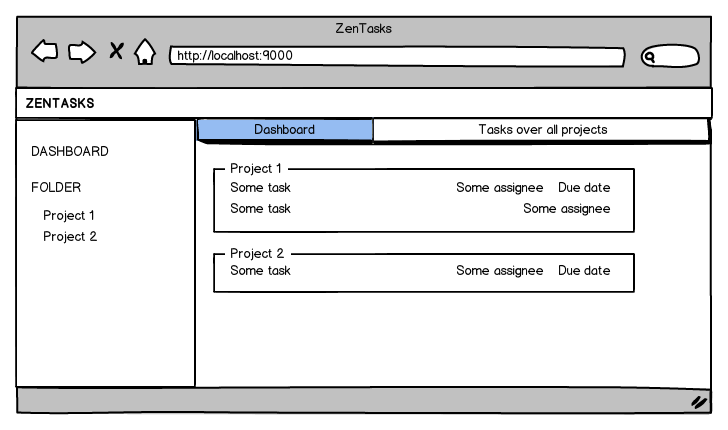 But because we haven’t developed the screens for managing tasks yet, we can’t populate the task dashboard with tasks ourselves. Now this will be called whenever play starts up. In fact this job will be run differently in dev or prod modes. In dev mode, play waits for a first request to start. So this job will be executed synchronously at the first request. That way, if the job fails, you will get the error message in your browser. In prod mode however, the job will be executed at application start (synchronously with the start command) and will prevent the application from starting in case of an error. You have to create an initial-data.yml in the conf directory. You can of course reuse the test-data.yml content that we just used for tests previously. 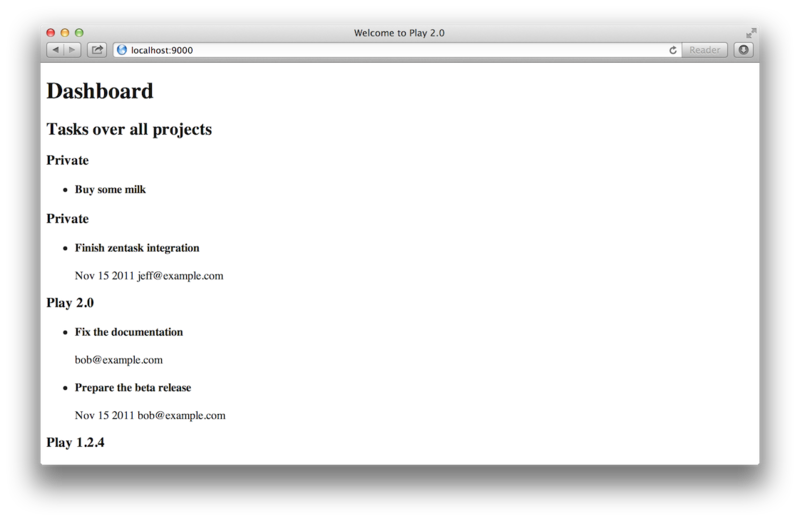 Now run the application using play run and display the http://localhost:9000 page in the browser. This time, we can really start to code the dashboard. Do you remember how the first page is displayed? First the routes file defines that the / URL will invoke the controllers.Application.index() action method. Then this method calls render() and executes the app/views/Application/index.scala.html template. We will keep these components but add code to them to load the tasks list and display them. Can you see how we pass objects to the render method? If you try and run this now, you’ll find you get a compiler error, because if you remember, our index template only accepted one parameter, that being a String, but now we are passing a list of Project and a list of Task. You can read more about the template language here. Basically, it allows you to access your java objects in a type safe manner. Under the hood we use Scala. Most of the pretty constructs you see (like map, case and =>) come from Scala. But you don’t really need to learn Scala to write play templates, just a small amount will allow you to do almost anything. Ok, now refresh the dashboard. Not pretty but it works! As we write more pages, we are probably going to run into cases where we need to render tasks again, and all that code to render a single task is going to end up being duplicated. Let’s use the template composition concept we learnt earlier to pull this logic into something like a function that we can call from many places. Reload the page and check that all is fine. As we discussed before, index.scala.html is using main.scala.html to wrap its content. Because we want to provide a common layout for all pages, with the right title, links, and a sidebar containing a list of projects, we need to modify this file. Also, if you were looking carefully, you’ll notice that in our index.scala.html template we never used the projects list that was loaded and passed in. This is where we are going to render it. These templates may be simple now, but they will allow us to reuse them early on, and as we make them more complex, every place that uses them will gain that functionality. And now refresh the page to make sure it all works. We should see the list of projects, divided into folders, at the top of the screen before the dashboard heading. Now the first version of the dashboard is almost done, but it’s not very pretty. We’ll add some style to make it shinier. As you have seen, the main template file mail.scala.html includes the public/stylesheets/main.css. The first thing to do is delete this stylesheet, because we are not going to use it. Rather, we are going to implement our stylesheets using LESS. There is nothing stopping you from using plain CSS for your stylesheets, but Play framework comes in built with LESS support, which allows you to define stylesheets in a more dynamic fashion, using varaibles, mixins, functions etc. Explaining CSS and LESS is beyond the scope of this tutorial, so for now we’ll just get you to download the stylesheets that we’ve already written. These stylesheets should contain all the styles needed to build the rest of the site. You can download a tarball of these files here, which you can extract from the root folder of your project, this will place a number of *.less files in the app/assets/stylesheets directory. LESS stylesheets need to be compiled to CSS before they can be used. Just like Play automatically compiles the routes, Java code and templates, when Play sees LESS files on your classpath, it will automatically compile them, and recompile them each time you change them. 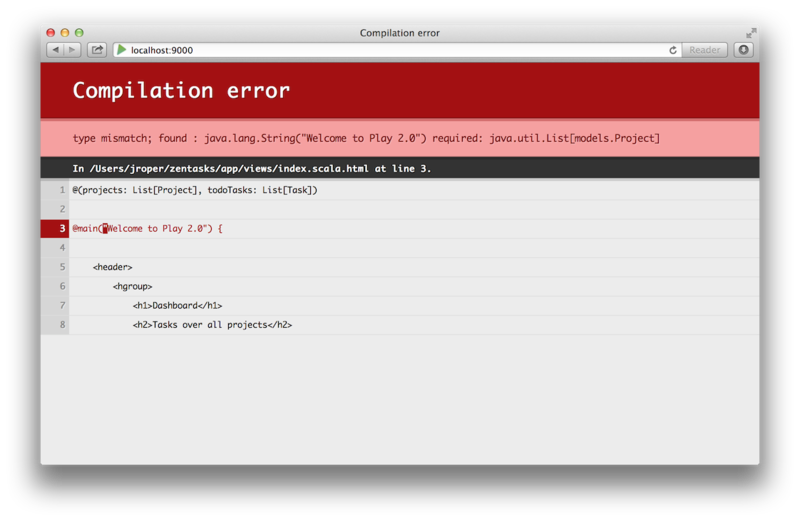 And again, it displays errors beautifully in your browser if a compile error is encountered. Since there is a app/assets/stylesheets/main.less file, Play will automatically compile this to replace our old public/assets/stylesheets/main.css file, so there is no need to make any changes to our templates (make sure you deleted the old main.css file though). Refresh the home page and you should now see a styled page. $ git commit -m "Dashboard"